WUHAN, China, March 28, 2019 /PRNewswire/ -- The shortlists of finalists in 27 categories including "Best Drink Concept" and "Best Food Concept" were announced at the Awards Ceremony of the World Food Innovation Awards 2019 held by FoodBev Media and the winners were also announced. BESTORE becomes the first snack brand in China that has been shortlisted. The World Food Innovation Awards are reputed as the "Oscars" of the food sector. The awards and shortlists each year represent the industrial frontiers and trends with most ambitious innovations and development of global food companies. 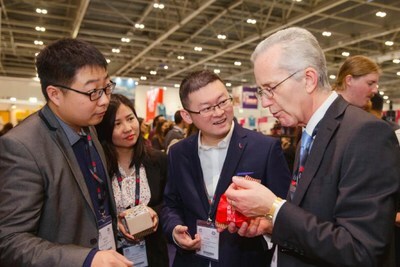 What's new at the ceremony this year is that BESTORE participates in the selection and has been shortlisted for the "Best Food Concept", becoming the first snack brand in China that has been shortlisted, with such typical Chinese delicious snacks as instant pork slices, crisp dates, dried mangoes, instant seafood snacks and new year gift boxes present at the ceremony held in London. Youmin Zhu, deputy general manager of Bestore Supply Chain, expressed that China is a country rich in food culture and hoped that BESTORE as the representative of high-end snacks could avail this opportunity to allow more people to understand Chinese snacks. BESTORE's product "Black Sesame & Mulberry Powder" has been shortlisted for the "Best Food Concept" of the World Food Innovation Awards 2019. Made with nine ingredients including black mulberries originating from Xinjiang and chia seeds from Mexico that are baked together under a relatively low temperature and ground in a traditional and refined way, the powder will not agglomerate even when prepared in cold water. According to the estimation by China National Food Industry Association, the Chinese snack market size has been increasing and reached almost one trillion in 2017. With such a large potential market, Chinese snack brands are rising rapidly and committed to becoming providers of delicious Chinese food. Established in 2006, BESTORE has become the leading brand of snacks in China. It has developed not only more than 1,200 kinds of snacks covering 12 categories but also 2,100 stores in 96 cities across China, which cannot be separated from its strength in product research and development. BESTORE has built an omni-channel model covering brick-and-mortar stores, e-commerce platforms, mobile APPs and O2O platforms. It now boasts 40 million VIPs with more than 400 million person-time in terms of product purchase. It focuses on high-end snack market segments and has been in a leading position in terms of sales in China for three consecutive years. BESTORE launched its high-end strategies and overseas layout last year. Online, it joins the "Tmall World" and other cross-border e-commerce platforms; offline, through the B-side dealers, it sells the products in the overseas supermarkets for Chinese. Up to now, it has brought more than 100 kinds of delicious snacks into 20 countries and regions including Europe, North America, Australia and Southeast Asia.